This page is written by the game's inventor, Dale Holmes. Given the challenge "Somehow, the number 10 must play a role in the game", I wanted to create something simple, elegant, and flawlessly refined. 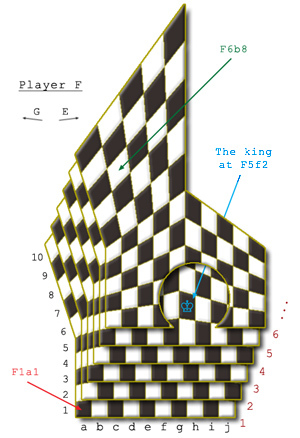 A re-imagining of chess both geometrical (what of a world where dividing a field into tenths is more natural than into halves?) and historical (if only India had become a colony of France instead of England!) that would so permeate it with tennishness as to be positively decadent. Well, that didn't happen. So instead I went after tens with knife, fork, and rammer, and finally pulled together this thundering battle royal with nothing but spit, sweat, and an unshakeable belief in capture by replacement. It's a game for 10 players on a 10 × 10 × 10 × 3/4 board, each using 10 × 10 × 2 pieces of 10 × 10 ÷ 2 types, from the 10 varied kings and queens down to 10 sorts of peasant, and allowing up to 10 moves per turn—the whole thing named for the man pictured on the U.S. $10,000 bill. 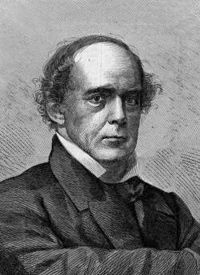 Salmon P. Chase, that is: raised by his uncle, a bishop; famously fought for slaves' rights (a crude form of pawn promotion); and created the Internal Revenue Service, thus becoming America's own evil king. How fitting that he should be remembered here. Ten ranks and ten files seemed a natural place to start thinking, and borrowing ten stories from Maack's Raumschach was the work of a moment. More troubling was accomodating ten players; the general approach of Rasmussin's three-player board is good, using progressive rhombic distortion to effectively allow each player one half of a 3/2 board. But it works better for three players. 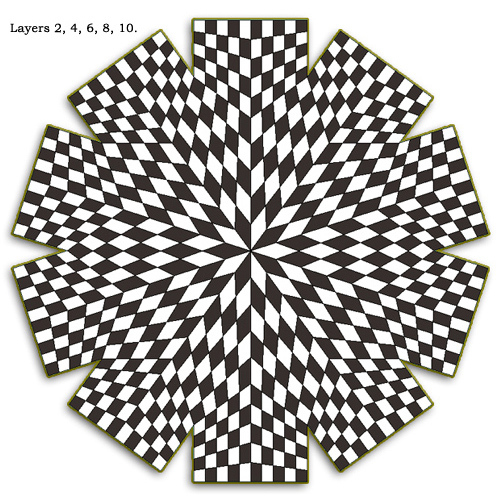 At 10/2, the distortion results in skewed rhombi eleven times longer than they are wide! 11 ≠ 10, therefore I looked for a gentler solution. The result shown here softens the skewing by adding cells, making each player's section of the board 10 wide by 10 high by sort of 10 spaces deep. Past the 10 × 10 × 5 line, territories overlap as they approach the central 10-point rosette. Still, a bit of overlap is more a problem for notational purposes than it is for play. With 2000 pieces in 7500 cells to take account of, the combatants should look kindly upon any small aids to navigation—I don't hear many complaints about the alternate black and white coloring of the cell floors, for example! In fact, adding this deeper equivocal territory makes the game interesting both for the designer and for players: pieces of unusual strength have scope for their talents in such a broad mêlée that would be lacking in a smaller board. I have tried to include a few ... but they will be described further on. Specifying the cells here is not an intuitive task, but of course it can be done. 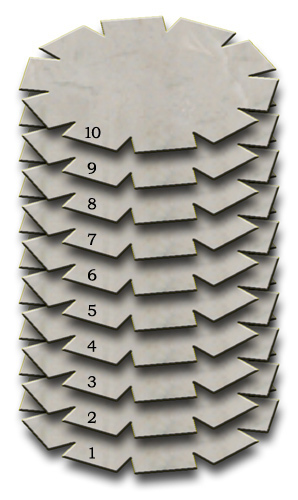 One approach is to divide the tower clockwise into decants for each player A--J, then taking the layers 1--10, and continue by bending & halving the files a--j and ranks 1--10. The resulting crushed heptagonal prism is not pretty to look at but the names are easy enough to write down, so we'll take what we can get. 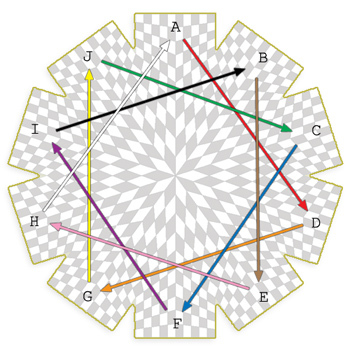 A delightful thing about using three dimensions in a variant is that we have more directions for the pieces to move: strongly orthogonal or rook-like moves that cross the faces between cells; strongly diagonal moves that cross at the corners, as enjoyed by the Raumschach unicorn; and something else in between, the edge-crossing moves that are definitely diagonal, but in quite an orthogonal way really ... well, at least they confine a piece to one color, we can say that much. Here is a picture illustrating the general idea. Playing around with a rhombic cuboctahedron is also a very good way to get these 26 directions to come alive as a system. 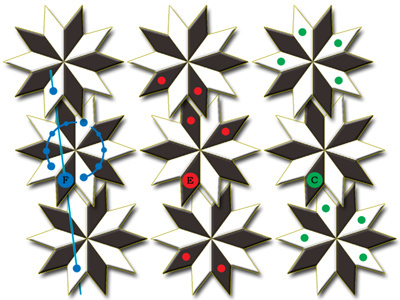 The central rosette of 10 rhombi found on each layer poses its own problems for 3-D movement. Since I use F, E, and C here as abbreviations to describe the powers of stepper-, leaper-, rider-, and cannon-type pieces it is just as well to give you this picture of my best results for moving around the singularity and get on with it. There should be no big surprises in this diagram. Cornerwise movement always entails a vertical drift, and edgewise stays on color. The curious markings on facewise movement are there to indicate that while crossing a wall into the next cell is allowed (practically by definition) pieces must not take too great advantage of this freedom—face riders who enter here may continue directly across and on to the other half of the board, or they must stay in a horizontal "orbit" or vertical "parallel" course until they stop moving. Leapers, whose actions are described as a series of facewise moves, must also attend to these details. There is still much to be said for common sense in such matters. An edge-travelling grasshopper from layer 5 who finds his screen piece on E in layer 2 should expect to end up on layer 1; he may choose his landing point from there, yes, but choosing something in layer 3 is really not done. I don't yet have a rigorous unified theory of chessboard singularities to tell us what is done in every case, but this much will do for Salmon P. Chess. This table lists all the types of pieces, with their powers specified in full and a count of how many appear on the board. I have tried to use the common names of their 2-dimensional analogues and others in the Piecelopedia, filling in a few names of my own where they seemed apt. In all cases, F, E, and C indicate movement and capture in the face-, edge-, and corner-crossing families of direction. When they do not appear, such movement is not allowed. What sort of movement is given by a suffix; 1 for a single step, ∀ for sliding movement of any length; ~ for a sliding movement that captures if and only if a screening piece has been passed through on the way, and ~| for a sliding movement that ends immediately behind such a screening piece. Non-capturing moves are indicated by f, e, c and where these are combined with other sorts of movement by +, it means the other sort does all the capturing and also general moving about; where they are combined by / it means that the other sort is only used for capturing. Leaper (or "knight") moves are specified by a series of numbers n1, n2, n3 which indicate how many face-crossing steps to take along the x, y, and z axes, where the numbers may be applied to x, y, z in any order, and ignoring any pieces encountered until the destination is reached. Zero is suppressed in these series so it may be assumed to recur when there are fewer than three numbers. No distinction is made between capturing and non-capturing leaps, because here they can always be used for both. In this game as in FIDE chess, pawns (a) start out in front, (b) are limited in their movement, and (c) may be promoted to better things. But the actual workings of it are rather different. How far to the front is covered in the next section; suffice it now to say that everything in that rank is ipso facto a pawn and treated as such, whether it is classed above as nobility, peasantry, or some nameless thing from the stables. They must move forward, of course, but the rhombic distortion of the grid lines makes the precise meaning of that unclear. What is clear—and close enough to be made the rule—is that pawn movement must be monotonic rank increasing ... that is, they can move any way they want so long as their rank number doesn't get lower. Up, down, and sideways are fine, but Player.Layer.File.x0 never goes to Player.Layer.File.x1 < x0. Eventually this has the effect of forcing pawns toward the center, which is good because that's where they receive promotion anyway. The opposite side of the board is too far away, the 10th rank is a bit too near, and moving to the first rank of a neighboring territory would just be silly (and ruin the "forward" rule besides). Pawns may promote at x.y.d10 or e9, and must be promoted at x.y.e10. Speaking of things that would just be silly, when a pawn is promoted, it becomes two pawns! The pawn is joined in its cell by another of the same type and the restriction to monotonic movement is annulled; then they immediately go their separate ways. This "promotion by meiosis" is an idea I've kicked around for a while, but in this game it finally seems to fit. (It was suggested by a line from one of Woody Allen's books: "The Great Roe is a mythological beast with the head of a lion and the body of a lion, though not the same lion." How that turned into this is an excellent question.) The trick only works once, by the way—an unrestricted pawn venturing back to the center does not clone yet another pawn for the army. Following the general spirit of Christian Freeling's idea that the power pieces should get a some room off the first rank, to arrange themselves without tripping over the pawn pieces (though not sharing at all his execution of that idea in Grand Chess), Salmon P. Chess puts the power pieces on rank 2 and the pawnlike ones on rank 4. This gives them plenty of room, and not incidentally ends any question of adding rules about an initial double step or capture en passant. They're certainly a horsy people in this little kingdom; but what would we expect from a royal centaur and his amazon bride? With their fondness for cannon and other war machines, though, they seem to be more like a big-budget Mongol Horde than Swift's Houyhnms. With an army like that, a fellow might well be ready to take on nine opponents! The object is to be the last King Centaur standing; that is, of course, the royal piece which should not be exposed to capture. When a player's turn arrives and his centaur is threatened with capture, and he cannot move it to any cell where another opponent could not capture it just as easily, he is checkmated. Considering that a centaur can move in one turn to 10 × 10 ÷ 2 (= 50) other cells, that requires a good deal of blocking and covering ... but it can be done. When a player is checkmated, he removes his centaur from the board and takes no further turns. His other pieces are left on the board, serving as unmoving (but still capturable) obstacles and screen pieces for the players still competing. What makes it more feasible to set up those complicated mates is the use of multiple moves. On each turn you may take up to 10 moves, provided (a) if you are in check at the beginning of your turn, you must get out of check on your very first move; and (b) each move is of a different piece—rather like João Pedro Neto's Portuguese Progressive Chess, except that there's no "progress" about it! You get 10 moves; if you don't want them all, you can pass; but you can't move the same piece twice in one turn. There is of course a wrinkle in this rule, to cover the case of pawn promotion: The two unrestricted pawns brought out by meiosis are regarded as different pieces from the restricted pawn that went in. Not a big problem, except that at least one must move away immediately; so it is never allowed to shove a restricted pawn onto x.y.e10 on your tenth move. It is good etiquette to warn the two players immediately before you in the turn order, at the beginning of their turns, when you have them in check. This forces us to allow cases in which a centaur is captured ouright, rather than mated; but though I find that distasteful, I think it is far preferable to a game in which strategy is drowned in a swamp of well-meant warnings and rapidly expiring predictions where coöperation is mandatory; and again, preferable to strategy being paralyzed by absolute injunctions brought from every meagrest possible future threat. So yes, centaurs may be removed from the board (and hence players from the game) by direct capture as well as checkmate. But this rule at least gives us yourself, two ahead to avoid, and two behind to warn: five, or half ten, players to consider in matters of check. The final point of play to mention is the ordering of turns. In order to moderate the intensity of territory wars between immediate neighbors on the board (which could obscure the scope and majesty of the game with purely local scuffles during the pawn-advancement phase) turns are not taken in strict clockwise succession. 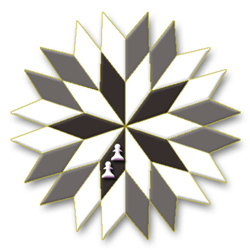 Instead a star pattern is formed as shown here, separating successors by two other players. 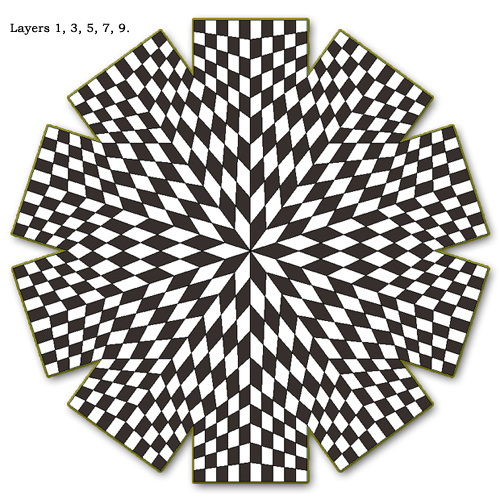 Let us reflect, with a smile, that if the shortest edges of the squares are made 2" long, as usual on chess boards, the entire layer will have a diameter of 7' (2.13m). Allowing a minimal 2' between layers to see whats going on and maneuver your pieces—with a long, long pincer-tipped crook, presumably—it will be eighteen feet (5.5 m) high as well. All in all a very impressive piece of gaming equipment for your rec room ... . These rules, of course, would benefit from extensive play-testing. If anyone will round up forty or fifty players and put their boards on a flatbed rail car for transport, my home town of Raleigh, NC (U.S.A.) offers the perfect venue for a tournament: The spacious grounds of our Dorothea Dix state mental hospital. Written by Dale Holmes. Webpage made: May 7, 2005. Alternatively, I can spend my summer coding this game, although I have no idea how one would store the board information. I'll have to analyze this game a bit more...it seems pretty interesting. I want to play this game. I seriously want to build and play this with a bunch of friends. I also have some ideas to make the board a little more compact, though it still won't be the sort of game one could pack up and play in a hotel room somewhere. If anyone wants to try and play this, leave a comment and we can try to get in contact. I'll keep checking this, even though the last comment was added nearly 5 years ago. Seriously. If you're as crazy as I am, I want to hear from you.